Amazing panoramic image of the Sydney Harbour Bridge and Sydney Opera House right before sunrise as it was seen from the Blues Point Reserve in North Sydney, NSW, Australia. The sky was in all hues from red, purple, orange and yellow turning the entire scene into magical place. 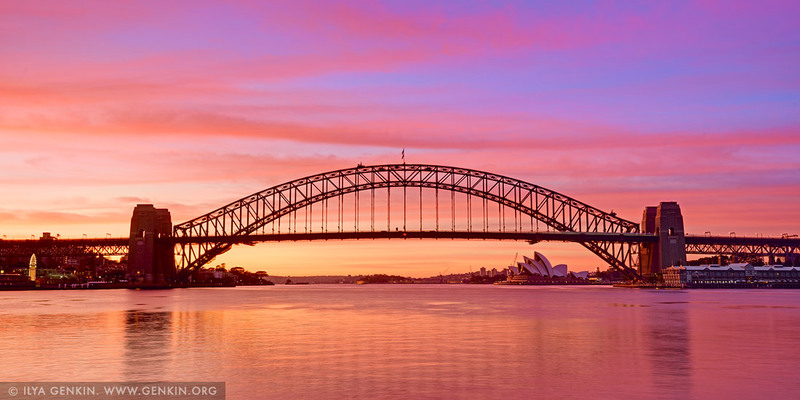 This image id AU-SYDNEY-HARBOUR-BRIDGE-0040 of Sydney Harbour Bridge at Sunrise, is copyrighted © by Ilya Genkin. This is not a public domain image.